Canyamel holidays take you to a beautiful area of Majorca. Located on the eastern coast, it nestles around a wide bay and is framed by pine forests.. It is a relaxed resort with a great sandy beach, ideal for families and couples looking for a peaceful retreat. Although fairly small, cheap Canyamel holidays offer a good range of recreational activities and tourist attractions. Holidays from your local airport. Low cost airlines operate from a large number of regional airports so travel to Majorca is both cheap and easy. With short flight times, you'll be sitting in sunshine, sangria in hand, in next to no time. Canyamel holiday season begins in April and ends in late October. Temperatures rise into the thirties at the height of summer. Early and late season are popular with those who enjoy walking along the many pretty forest trails. 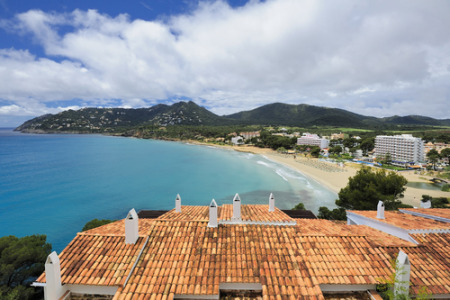 Canyamel lies between the resorts of Cala Millor and Cala Ratjada. It has a soft sandy beach that slopes very gently into the clear waters of the bay providing safe conditions for paddling and for young swimmers who need to gain confidence. Hotels and apartments give good accommodation and high standards of service, with tariffs to suit most budgets. Whatever you fancy eating, the numerous eateries with their wide range of menu will certainly satisfy. The provision of shops is fine for holiday essentials and gifts and souvenirs, but for the serious shopper a trip to the market in Son Servera or to Manacor would probably be enjoyed. Canyamel nightlife is fairly low key, reflecting the resort's popularity with families. Those looking for a party atmosphere can take a taxi to neighbouring Cala Millor. It is there that you will also find a range of water sports. Golfers have a choice of courses and there are several tourist attractions in the area. Make sure you visit the fascinating Caves of Drach, the illuminations in the many caverns create a wonderful effect. Search and compare holidays today. If you fancy a Canyamel holiday but find the task of trawling through web page after web page looking for the best deal a little daunting, try our simple search facility. You'll find over three dozen travel companies, including leading brands, competing for your custom. It is simple to use, and remember, competition brings out the best bargains. Our search facility enables you to see, at a glance, the Canyamel holiday that is the cheapest, and the one that offers the best value for money. It couldn't be easier. All you have to do to secure the holiday is make a phone call. As offers change daily, in order to avoid disappointment, you should ring today.